Andishe is a thriving health and beauty blogger from Los Angeles, California with BA from UCLA in Environmental Studies and Geography and a Masters in Public Health from Loma Linda University. As a young girl living in Iran, she was fascinated with culture , traveling and the world surrounding her. While studying different cultures Andishe soon learned about Ayurveda, its remedies, herbs and spices, and the uses of natural oils for health, beauty and vitality. She is a believer that this holistic way of living has truly kept her young, vibrant and healthy. Putting pills and traditional medicines behind she often creates her own beauty and health products from natural ingredients sharing her acquired knowledge through her website aunaturalebabe.com. But her mission doesn't end with social media and blogging! As she plans to educate the masses on a broader global level, about disease prevention, food growth and healthy practices. Do you ever give yourself a break? Do you ever just have your “Me Time” and nothing else? Why not give yourself a day off? Get that spa treatment-at home with natural ingredients, or even go out to a park and watch the kids play? There are a wide varieties of activities you could be doing, anything other than work. Just you and your day, meant to spent it on you or on your friends, your pets, your families, or…in bed! You may be surprised to hear that the tradition of “a day of rest” is observed all around the world. Some of us in the states work ourselves like a machine: get up early, go to work, come home late and repeat the same thing everyday. Then we wonder why we are sick, always tired and reach out for that coffee…at 2 PM! There must be a reason that prophets and holy books talked about implementing a day of rest. In Judaism as well, there is the concept of “Shabbat” where the seventh day of the week is saved for rest particularly. Even If you’re a Buddhist, there is the concept of “Uposatha” which is the Buddhist day of observance, referred to as “The cleansing of the defiled mind”. Helps maintain a healthy weight – because sleep and metabolism are controlled by the same area of the brain. Also researchers have found out that sleeping releases hormones which control your appetite. Scientifically speaking, those who are well rested, not only look more youthful, are healthier and have the ability to lose fat more quickly. Keeps your heart healthy – because your heart doesn’t work in over time, a day of rest keeps your heart and system happy. Improves your memory – because a lack of sleep makes it difficult for you to concentrate. Reduces stress – sleep and stress have similar effects on your heart. When you are well rested, you function better and are less stressed. To conclude this post, I would like to point out another interesting fact, because if the above reasons didn’t convince you to implement a day of rest, the thing you’re about to read, will! 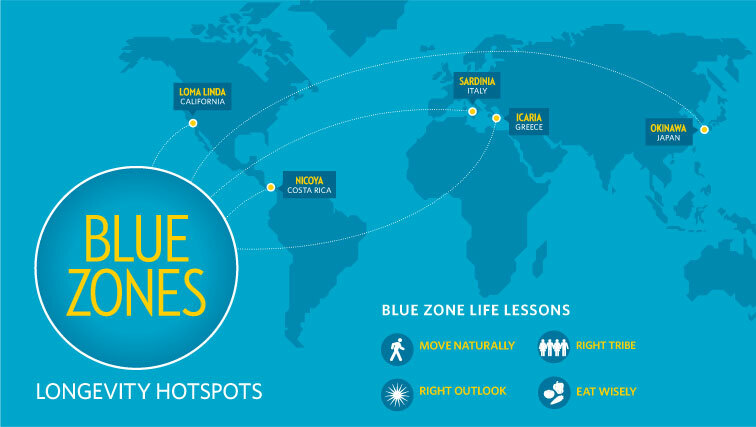 Did you know that there are 5 “blue zones” in the world? These are the areas associated with a long life AKA longevity hotspots where people usually live up to 100 years. WOW! Ok what do you think all these locations have in common? Of course a well balanced diet, more gardening, less rates of cancers, and…you guessed it, a restful life. In Loma Linda CA specially, a day of rest is observed as the majority are seventh day adventists who observe “Sabbath”. Are you starting to see why you should implement a day of rest now?